Flinders University researchers have now discovered that a stream in a deforested Adelaide Hills catchment shows a decreasing salinity trend over the past 28 years, pointing to possible long-term remediation of salt-affected land. 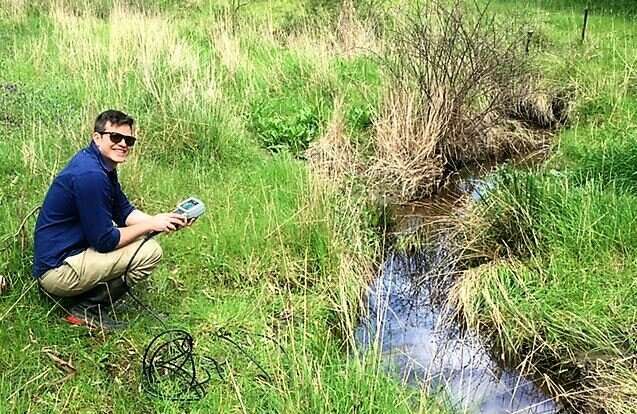 Flinders Ph.D. graduate Tom Anderson led a study of Scott Creek, a high rainfall area, that shows the combination of time and volume of water flow has resulted in salt regression through it being flushed from the water table. He believes the methodology could have wide application across Australia – especially reading areas where streams and rivers have been affected by high salinity. Dryland salinity occurs after deep-rooted native vegetation (mainly gum trees) has been cleared and replaced with short-rooted agricultural crops, which allows more rainfall to infiltrate into groundwater and subsequently raise the water table. In the case of Scott Creek, reaching a return to salt equilibrium is happening faster than expected—within about 300 years of this area being deforested, noting that continued rainfall and drainage are key factors to ensure continued change. Flinders University researchers documented this desalinisation in a paper published in Hydrogeology Journal titled "Salinity balance and historical flushing quantified in a high rainfall catchment (Mount Lofty Ranges, South Australia)", by Thomas Anderson, Erick Bestland, Ilka Wallis and Huade Guan. Mr Anderson says the results came as a surprise, emerging as an important side-project into his examination of salinity trends. He believes this new way of assessing existing high-resolution data will reveal fresh insights to a range of waterways in different locations across Australia. "Now it's time to go into other areas to apply the same testing methodology – in areas of lower rainfall, and subject to more extreme salinity damage," he says. "Fortunately, for the interest of future studies, many rivers throughout South Australia and around the world contain such data." Theories of reaching a new salt equilibrium have been conceptualised by scientists since the 1970s, but this is the first study to reveal a statistically significant trend that shows a stream returning to a new salt equilibrium. A 28-year record of flow and salinity in Scott Creek (between 1989 and 2016) was analysed, based on monthly data. Salt deposited in rainfall compared to salt exported from Scott Creek, determined that approximately three times more salt was leaving the catchment. Over the time period investigated, salt load exported to surface water decreased by, an average 6.4 tonnes annually due to catchment freshening. The stream could reach a new and lower salinity level by 2090 if this trend continues at a constant rate. Mr Anderson says evidence of a catchment returning to the original salinity levels before European settlement is exciting news for farmers, as southern Australia continues to face great hardships from salinity issues.